I really love my horse, Gadget. He is a very sweet, soft, true, loving animal and pet. And he thinks he is a human. He is a bay and has a big white dot on his forehead. He is also very cute. His daddy’s name was Gizmo and it just makes sense that his son’s name would be Gadget.And I have riden him once. IT WAS AMAZING!!! 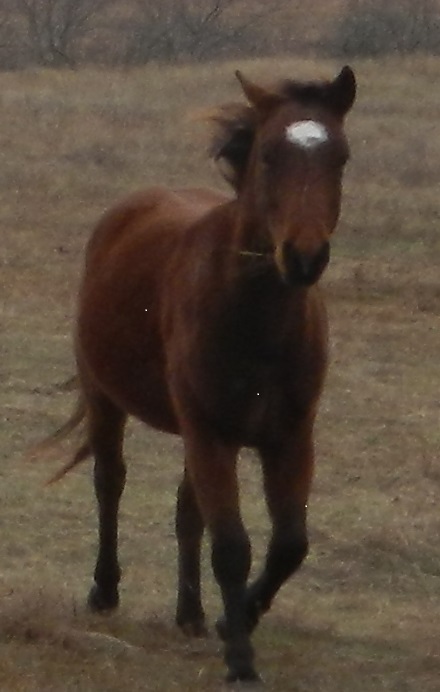 One of our horses is an older horse, Huddy, is a very sweet mare. And although she is rather old she always does what we tell her to do. What exactly do we do with our horses? Well we go certain places and gather cattle for certain people. Some people may use four wheelers, but we prefer horses. So our horses are mainly used for working purposes. Yes we do feed them grain and sometimes in the summer I will go give one a bath with a bucket of water and an old rag. And when they are hot and sweaty after a hot summer gathering we’ll go rinse them off with the hose (although they usually just roll in the dirt afterwards). So horses(on our place at least) aren’t really pets. My dad says that Gadget is about as close as you can get to a real pet. Gadget is a real sweety. Once when I went to see Gadget, I wasn’t very close when he started walking toward me! It was really cute! Then he started nuzzling my ear, (that is what he does if he likes you!!) then he followed me back to dad! What a cutie!!! I really do LOVE horses. Just maybe not as much as dogs… just don’t tell Gadget that. And I sometimes call him Gadgie, it is his nickname! 83 THOUGHTS! (well, it’s 84 now. )*eyes open as wide as saucers*That’s a lot of comments! Haha, yup! 😉 I guess people like Horses! Hehe, I love horses! XD 😛 I used to ride and I loved it! Do you ride English or Western? That would be neat! If you did, you’d have to post pics of it! 😛 🙂 XD 😀 Gadget (My horse) Is a Quarter Horse, he’s a bay gelding! And sometimes he’ll give you hugs!!! 🙂 Like you hug him, and he’ll wrap his neck around you!!!! 🙂 🙂 😛 😀 I love him so much! Aww! He’s a sweet heart! YES! 🙂 Oh, yea!!! I LOVE Winter! I want to meet her SOOO bad! 🙂 🙂 I think she’s amazing! 😛 It makes me just about cry every time I watch someone with her, cause I want to see her so bad!! Thank you so much for following me!!!!!! I have to go do chores now! Thanks so much for the comments though!!!! Hehe! Okay! Ooh! neat! 😉 🙂 😉 😛 Thanks! Neat! 🙂 Thanks! That’s sounds cool…ooh! Sounds hard! XD Hehe! 🙂 Cool! Your horse is so beautiful! I LOVE his red hair. Oh, and I was looking through the comments, and saw that you’re on the hunt for good books. So, read one for my english class called “Wonder” by R.J. Palacio, and it was really good. Ummm … the Hunger Games series was awesome, but you may want to check with your parents before reading those, because they’re pretty gory and violent. And, yes, romantic. But, other than that, Suzanne Collins is an AMAZING writer! She’s so good with words and everything. Anne of Green Gables and Anne of Avonlea are great books, but the rest in the series are a little more for adults. Or, that’s what my mom said. They are by L. M. Montgomery. And, I’m sure you’ve heard of this before, but the tale of Despereaux is really good! It’s by Kate Dicamillo. Oh, and Garfield ROCKS! It’s a comic, but he’s still super awesome! Like Rose said, Warriors is good. They’re actually like my favorite books! Well, I don’t really have a favorite, but they are one of my favorite. 😀 😛 If that made any sense! He, he! Thank you!Okay! Cool!!! Thank you so much for all of the book suggestions!!!!! 😀 THanks! I might check some of those out!!!!!!!! Boy, you’re a fast responder!!! 😀 XD Hehe! Ya! I like to respond quick, plus I’m on the computer a lot! I LOVE to blog and be on the computer, but I’ll probably have to get off soon!!! Do you have any animals? I may have already asked you this! XD What’s your favorite color? Mine is Blue!!! Yeah, I love the computer too! I do have animals. I have three cats, two rats, and one dog. My favorite color is green! Yeah, I read your page where you introduced your pets. That’s quite a lot! Do you have a Duolingo? I do! It’s where you can learn a language for free and follow people! Nope. But I have rosetta stone. That’s a language learning program! I did that for a while, but I like Duolingo A LOT better!!!!!!!!! I’m learning Spanish! If you ever do get it, I’ll follow yoU! It’s kind of like a blog where you follow people!!! 😀 XD XD 😛 : XD My name is Animals21, that was before my crab died! 😦 I have to go, bye! By the way, how is your name pronounced??? I really like how it’s spelled!!! He is! Cool! 😀 Oh, that’s cool! We have a lot! Thank you so much! I like them so much! Now you made MY day! Can you tell me how old you are? I’m 11! What is your other blog name?! I want to see it!!!!!!!!!! Ya! I totally understand, that’s FINE! I requested access to your private blog, and if you don’t let me in, that is FINE with me, really! I just thought I would, JUST in case! No hard feelings though if you don’t want to let me in! I understand, but there is ONE favor I’d like to ask you…if it’s alright, just a recommendation! Ya, I’m really sorry, My mom had to get on! I was wondering if you had any good recommendations of good books!? I need to find good books to read! If they’re animal books, that would be even better! And thanks for letting me into your blog!!!!!!! The Amazing Tales of Max and Liz by Jenny L. Cote. This is a six book series. They are long. Adventures of Max the Dog and Liz the Cat as they work through the stories of the Bible. There are other animal characters in these books as well. Okay….alright…..okay, cool! Wow! That last one sounds cool! Thank you so much Rose! YOu have helped me A LOT! THANK YOU!!!!!!!!!!!! That picture of Huddy is so cute! Umm…Ya, I guess that would work…I like it…except……..well, that would mean it would have no pictures except for the first one… But, Ya! It also wouldn’t have the thing about Guiney, that told about her, but ya, I’m sorry, I don’t mean to be negative about it, I think it would work fine, it IS a LOT easier to read…ya! I think we should do it, that would work fine! Do YOU want to delete the other three? Or do you want me to? OH yes, I was thinking if you want you could make a collage to put afterward! 😀 No, I’m happy that you didn’t just say, Okay. You could diffenatly include all of those things too! alright…I think I might make a collage!!! 😀 Thanks! Hey there, Megan, I need to talk to you on the drafts of ourcolorfulideas! Please!!!!??? Yup! I’m on the post times one. Peach is cute but she is in pasture right now!! I love your horse! Pepper sounds like she is a beautiful horse, and I bet Peach is cute. 🙂 Those cattle gatherings sound like so much fun! My clarinet is black edged with silver. My ukulele is a mahalo. It is red. But I don’t know about the clarinet. I don’t think Ive heard of a Mahalo brand. Is your clarinet silver? My mandolin is a A style. I have thin brown hair and blue eyes my hair is up to my shoulders I play the clarinet I can play 8 notes I also have ukulele. that’s cool! My sister plays the ukulele! What brand is your clarinet and ukulele? My mandolin is a Kentucky brand. And I really like playing it! That would be awesome! You crabs sound so cool. My crabs are cool! I can’t wait to get pictures of my crabs. And guess what? Two of my crabs changed shells recently. Derf changed shells and Fred changed into Derf’s old shell! Do you play an instrument? I play the mandolin! What color of eyes and hair do you have? Is your hair thick? Mine is VERY thick. Thanks for all the comments. Have you ever visited http://haydensanimalfacts.wordpress.com/? I like it. I think it would be cool if you got fish. We could tell each other about having fish, like John died a couple days ago! Well, talk to ya later! Wow you are so lucky!!!!!!!!!!!!!!!!!!!!!!!!!!!!!!!!!!!!!!!!!!!!!!!!!!!!!!!!!!!!!!!!!!!!!!!!!!!!!!!!!!!!!!!!!!!!!!!!!!!!!!!!!!!!!!!!!!!!!! Yes I know I am! I LOVE animals and am very blessed to have a good life riding horses, gathering cattle, playing with dogs, Chickens, and fish and Crabs. One of my crabs changed shells just today! For the second time since I got him!!! Maybe I can put a video of Gadget on here soon!